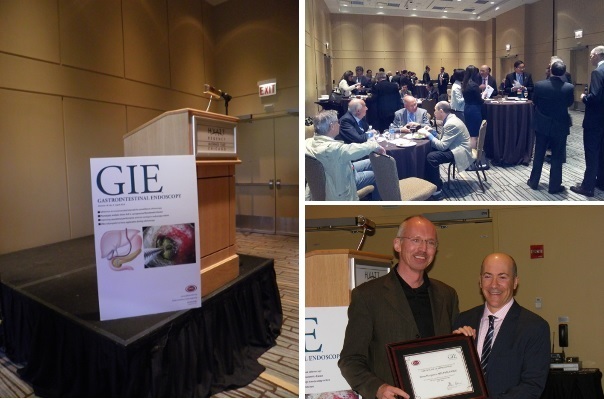 Many activities related to GIE took place during Digestive Disease Week this year in Chicago. Twenty-one author interviews were taped on Monday. New author interviews filmed at DDW will be featured in upcoming issues of the Journal. Thank you to all of our interviewers and authors who participated! GIE Associate Editors met for a dinner to celebrate their accomplishments and hard work on the Journal. The GIE Editors’ Reception was held Monday evening, honoring this year’s Reviewer Award Winners and recognizing the current Editorial Team. Be sure to read the 2014 DDW abstracts published in GIE, available online only! Download the abstract issue through July 2014.